Grandparents chat face-to-face with grandkids over iPhones. Facebook users broadcast live from concerts and games. Pundits Skype into CNN every day. Yet lawyers still fly around the country with boxes of hard-copy exhibits to conduct depositions in person. Why? It’s costing you time and energy and costing your clients money. 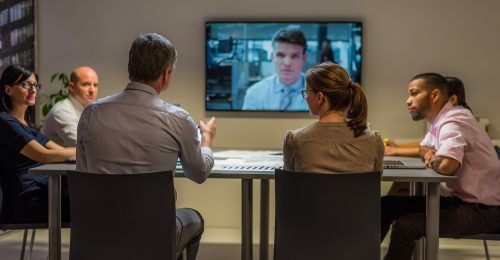 Remote depositions conducted via videoconference put lawyers and deponents face-to-face across wide distances and can include electronic exhibits and a streaming realtime feed from the reporter. In addition to being more efficient, remote depositions can yield output that’s more effective with clients, juries, and judges. Better value for your client. When attorneys fly to and from depositions – especially internationally – the travel is costly for the client. While you may want to depose key witnesses in person, remote depositions are extremely effective for ancillary witnesses or preliminary fact-gathering sessions. If you include electronic exhibits in your remote deposition, you can also save your client the expense of copying and shipping boxes of exhibits. Productivity. 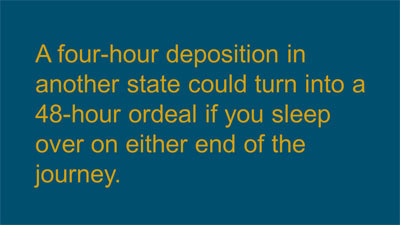 A four-hour deposition in another state could turn into a 48-hour ordeal if you sleep over on either end of the journey. The time – not to mention the sleep loss, running to airports, waiting in airports, packing, and unpacking – constitutes lost productivity for you and your firm. 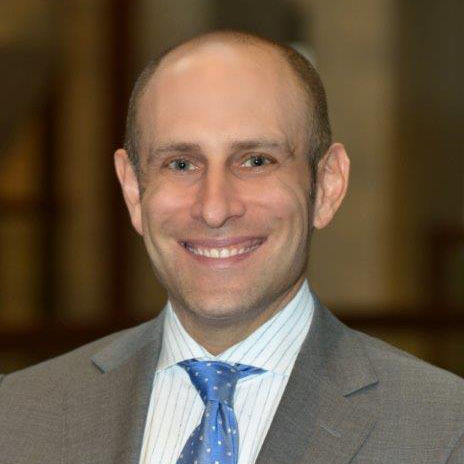 Even the courts have issued guidance encouraging the use of remote participation by attorneys, expert witnesses, interpreters, and treatment providers, as well as child victims and inmates. Client insights. Insurers and corporations want to know they’re settling cases at the right time for the right amount. With remote deposition technology, you can provide your clients with an easy and cost-effective way to gauge the credibility of the witness and whether the case should settle. Subject matter expert and remote attendee collaboration. Remote depositions allow you to leverage technology to include remote attendees. Subject matter experts can link in from afar and participate behind the scenes via secure, non-discoverable chat. Moreover, your litigation team back at the office can do the same. By leveraging video technology, real-time streaming, and electronic exhibits, your team can quickly and efficiently provide you with questions, documents, and legal research you need to conduct an effective examination. Work-Life Balance. Sometimes life happens, and traveling to depositions becomes challenging or impossible. For instance, a pregnant attorney whose doctor wouldn’t allow her to travel needed to take several depositions before the discovery deadline. By using Esquire’s remote deposition technology, she took multiple eight-hour depositions from her office in Phoenix, while the opposing counsel, witness, and court reporter were in Boston. If you lead a claims department or corporate legal team, you know how important witness credibility can be to determining the proper outcome of a case. Consider the value to your settlement strategy of seeing witnesses with your own eyes (and knowing you’re saving time and the expense of travel, as well). If you’re a lawyer, take a hard look at all of the deposition costs you incur, including how much of the expense stems from travel and the copying and shipping costs of using paper exhibits. Remote deposition technology lets you directly pass these savings to your client. Finally, don’t worry about the technology learning curve. If you have any associates who are conducting depositions, you’re all set. They are naturals with the technology. They grew up with it, and it’s the way they like to work. If no one on your team is a tech wiz, you’ll still be okay. The technology is easy to use, and with some quick practice, you won’t miss a beat.